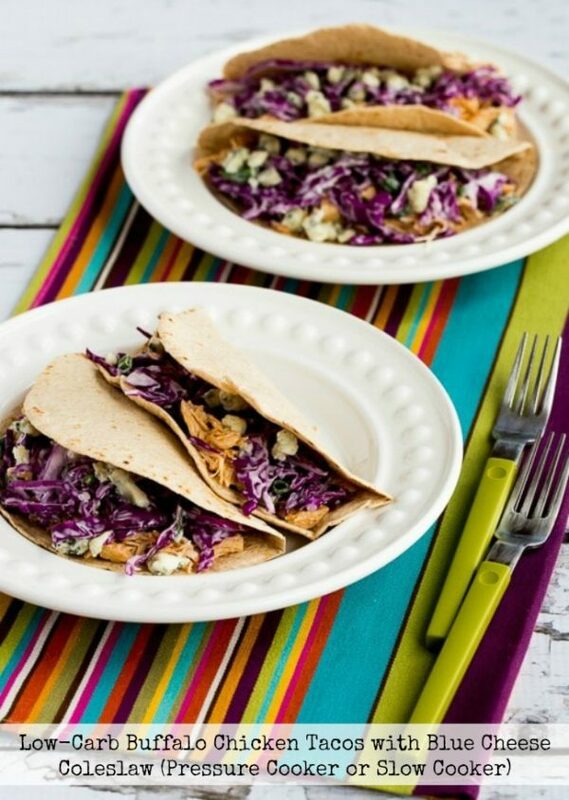 Low-Carb Buffalo Chicken Tacos with Blue Cheese Coleslaw from Kalyn’s Kitchen are the perfect go-to recipe if you like the flavor of Buffalo chicken. I say this is a great dinner option and it’s also low-glycemic and South Beach Diet Phase Two! Click here for 65+Slow Cooker Taco Recipes with Beef, Pork, or Chicken. The highlight of these Low-Carb Buffalo Chicken Tacos with Blue Cheese Coleslaw from Kalyn’s Kitchen is the Frank’s Red Hot Sauce and the smooth delicious taste of the Blue Cheese Coleslaw; those two ingredients are what make these tacos delicious! The moist, shredded Buffalo chicken is tucked into low-carb tortillas, then topped with the Blue Cheese Coleslaw. I love that Kalyn makes these easy and tasty Low-Carb Buffalo Chicken Tacos in an Instant Pot, or they can also be made in the slow cooker if you prefer, and sometimes I do. These Buffalo Chicken Tacos are a great one to share, so invite someone over to enjoy these delicious tacos! Get the complete recipe for Low-Carb Buffalo Chicken Tacos with Blue Cheese Coleslaw (Pressure Cooker or Slow Cooker) from Kalyn’s Kitchen. Check out the Slow Cooker or Pressure Cooker Chicken Recipes that have been featured on this site!